Commonly available screwdrivers with a shank cover is for the purpose of short-circuit prevention, NOT for electric shock prevention. The VDE mark is allowed to be on a product which has passed the 1000V energization test (all pieces). Additionally, this mark proves that the product has passed 6 severe tests, apart from this 1000V test. 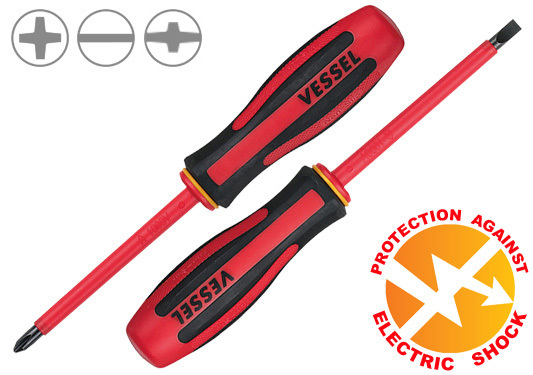 It is highly recommended to use VDE marked insulated tools, with measures against unexpected electric shock taken, especially for the high voltage work which may induce serious electrification accidents. NEVER USE FOR HOT-LINE JOB. RISK OF ELECTRICAL SHOCK. Make sure in advance that the usage environment is less than 1000V AC / 1500V DC. USE INSULATED GLOVES WHEN WORKING WITH THIS SCREWDRIVER. Insulation is applied only to the grip and the red shank cover. STOP IMMEDIATELY using this screwdriver when the yellow shank cover is comes out or there is damage or alike on the product.